Terry Poplava from Our Sunday Visitor traveled with Msgr. Lofton to Fiji. Msgr's photos can be seen here, and Terry's personal account can be read here. We began our work in Fiji, somewhat by accident, when I took a month off to rest and do some writing for my 25th anniversary of ordination. I ended up on the Island of Taveuni, in the northern section of the Fiji Islands. I stayed at a small but wonderful resort (with no electricity or air conditioning!!) called Makaira, and I met John and Roberta who owned and managed this beautiful place. A few days after my arrival, I went down to the Catholic Center in Wairiki and met the Pastor, Fr. John Crispin SM. (He is now in Suva and is the Secretary for the Bishops of Oceana.) I saw the wonderful classical Church building which was built approximately 150 years ago, Holy Cross, and the attached school with grades from kindergarten through high school, serving over 800 students. Fr. Crispin invited me to lunch and a tour of the Catholic Center, and within a week I was saying Mass, in English, and bare feet! (In Fiji, shoes are not worn in your house or God’s house.) It was very evident from the tour that this facility needed many repairs and some TLC after standing through many storms, earthquakes and time. Fr. Crispin learned that I was the Director of the Propagation of the Faith for the Diocese of Charleston, and he spoke about their many physical needs and asked if we could provide some needed assistance. 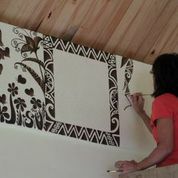 And so our work began in Fiji. 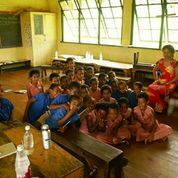 To date we have provided assistance to complete a village church on the island of Vanua Levu, a nursery on the island of Rabi, assistance in Wairiki with building a kindergarten, teacher’s houses, print machine for the school and a new roof on Holy Cross and other renovations. The largest project was building a new station church for the village of Naselesele. 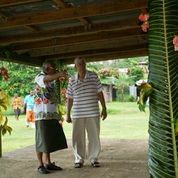 It was around four years ago when visiting Taveuni that the village elders asked if I could help them build a new church as the present building was small, termite eaten and in poor condition. After checking on the status of the project with Fr. Crispin, I nervously said, yes, and soon the old church was torn down and construction began on the new church. Many pictures were sent and I was amazed at the villager’s hard work and building skills. Roberta Davis from Makaira was the indispensable manager for the project, managing the funds, ordering materials, and solving problems. On August 25, 2014 the new Naselesele church was blessed and dedicated!! August 2014 Update....Bula from Fiji! Hurricane Winston Hits Fiji Islands……and the blessing is all our projects were spared! On Saturday Feb 20th, 2016, the Fiji Islands were hit with category 5 hurricane Winston with sustained winds of around 160 miles per hour and gust over 200 mph. Said to be the most severe storm to ever hit the Western Pacific, it caused total destruction to anything in its path as it moved through the chain of islands. Many smaller outer islands have still not been heard from and the Fijian Government is still doing damage assessments and emergency assistance. The office of the Propagation of the Faith has been involved in building and repairing churches in the northern section of the islands for the past ten years. 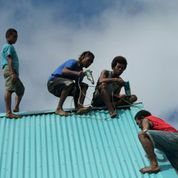 The main Catholic center on the island of Taveuni at Wairiki with its 150 year old church was renovated three years ago and it received a complete new roof along with external and internal repairs. A completely new church was also completed three years ago in the village of Naselesele located on the northern end of Taveuni. This past summer, Msgr. Lofton was asked to assist a small village, Nawi, on the neighboring island of Vanua Levu, with the repairs of an older church. After visiting the village and check the condition of the church it was determined that, the building was not reparable and it needed to be demolished for safety reasons. Msgr. Lofton just returned from Fiji three weeks ago after ordering materials for a new church and negotiating with a builder to begin working on the foundations for the new church. News of the terrible storm caused great concern to as Msgr. Lofton who was worried that all the work done on the islands was destroyed and the people of Fiji had lost their home and lives. All attempts of communication failed as phone lines and cell towers had been destroyed. Columbian Father John McEvoy and Donal McGrath who were near the epicenter of Tropical Cyclone Winston wrote in one of the first emails to be sent after the storm, that in this Holy Year of Mercy, the storm …"had no mercy on us whatsoever. It wreaked havoc throughout this little island nation…" They go on in their email to list the magnitude of the destruction that had taken place in their area to Catholic Schools and Churches. Msgr. Lofton heard from some friends in Taveuni that the destruction was wide spread but the 150 years Church in Wairiki had survived as well as the new church in the village of Naselesele. They had suffered some damages but were in sound condition. He has great concern about the small village of Nawi which boarders the ocean and faced 36 feet of water from storm surge. Donations can be sent to the Office of the Propagation of the Faith, St. Theresa the Little Flower, 11001 Dorchester Road in Summerville, SC.